3rd year of EN , 7th IM w/ 6 finishes and 1 DNF. KQ’ed @ Texas in May. Racing M-50-54AG , 120-122lbs , FTP 230 , Vdot 51. Was having a fantastic season until I broke my clavicle in a bike crash 12 weeks before KONA and 4 weeks before Mont Tremblant planned race. Had surgery immediately , got bolted back together , took a couple weeks off and started training again. Unfortunately but intelligently sat out Mont Tremblant (thanks to EN discussions). Built back up the training over the next 2 weeks and then did a good 5 weeks of IM volume. Feeling as good as new, the clavicle was not an issue. 10:47:52 , 76th out of 175 M50-54AG , 1082 out of 2134 Overall…. Only in KONA can you barely be in the top 50% with a sub 11hr IM. Arrived 10 days early , checked into condo Hale Kona Kai (thanks Al great recommendation) , 1st day -rented car, bike for Heather, easy swim and run. 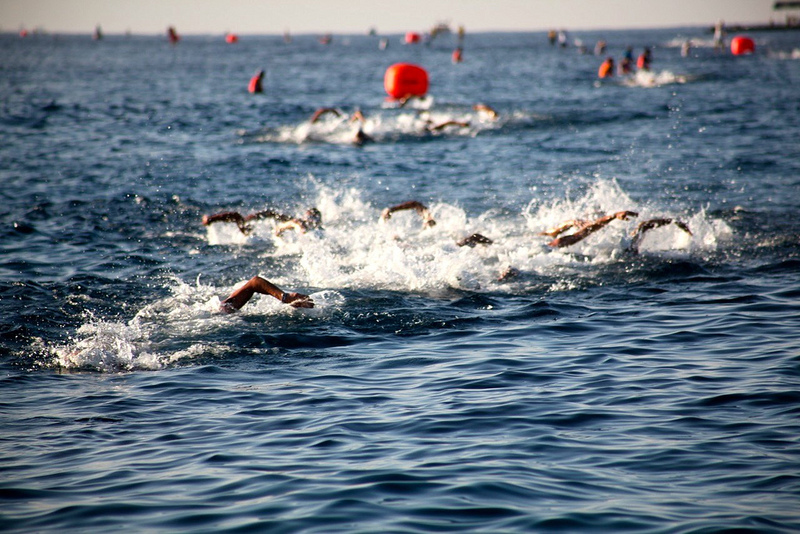 2nd day we participated in training/race swim on the full course (timing chip 200+ mass start) 1:19 swim oh boy currents reminded me of Cozumel I guess my swim isnt back to 100%. The rest of the week was swim/bike/run taper mode to acclimatize , with the most important ride being the climb and descent of Hawi to experience the winds. Some tourist stuff but no Volcano due to govt. shut down. Up 6AM… banana , papaya , hempseed almond milk smoothie with rice cakes, cashew butter and dates. 15min swim to try out new TYR swim skin 25%off couldnt pass it up . Met EN peeps Dave, Teri , Stephanie, Scott, Kate, Matt Ancona and also joined by Kate’s husband Joe and my Heather , for a second breakfast at Dennie’s 10:30AM. Big bowl oatmeal, banana, brown sugar. Lunch – sweet potato, hempseed, tahini and agave. Dinner- bowl white rice, hempseed and dark chocolate. Drank coconut water and salted everything all day. Up 3:45… bowl white rice, hempseed, dark chocolate…..coffee….Head to body marking by 5am(checked in @ 122lbs fully carb loaded)… transition set up (my pump broke had to borrow one)…. back to Heather for 15min for more sunscreen and lube to chaff areas…. I can’t say enough about Scape sunscreen (I dont think they make it anymore which is a bummer cause I’m running out)….I put thin layer on night before, again upon wakening and then one last layer pre-swim and never again the rest of the day and was fine… After the Pro’s started went back into transition to line up for our entry into the water. Goal of around 1:15 after experiencing the currents in the practice swim . Lined up on the leftside , about 1/4 of the way in and 1/4 of the way back…. Only warmed up swimming out to my position…. Treading water forever , I started to get cold… Finally the cannon goes off… My first 3-400 yds were the cleanest part of the swim . Zero contact…. Slowly merged into the buoy line where contact increased but was very manageable. 1st half pretty uneventful. After the turnaround contact increased significantly and I had somebody draft me the entire way back constantly tapping my feet. Occasionally if I came upon traffic, they would climb up my calf’s grrrrr this was getting annoying. Stayed in my box , tried to shake them but kept swimming… The last 100 yds was the worst part of the whole swim, too many people and not enough room funneling us to the exit. Finally out of the water in 1:15 . 4 minutes faster than practice race. The practice race measured 2.59miles and the race measured 2.69miles on Garmin. 3:34 smooth as I could, swimskin cap goggles off, picked up bag, thru tent , take shoes and glasses out of bag, run to bike, put shoes and helmet on at bike… go! Goal Watts 165-168ish IF- .70-.73 purposely at the low end of my range to respect this race and save myself for Florida in 3 weeks. For a perspective ALL 5 of my long training rides of 5hrs or more were between IF .75-.78… Actual numbers AP162 , NP166 , for a VI of 1.025, IF .72 , TSS 280 and a 5:25 bike split… The bike course was fully exposed sun all day very hot with favorable winds on the way out , light winds (compared to normal) up and down Hawi and a very steady annoying headwind all the way back. Had no problem riding this course steady a with the exception of descending Hawi. Pretty uneventful bike just steady all the way thru riding my highest 5mile power split @ 105-110miles executing as planned and leaving just a little bit on the table. I compared my bike split to a guy who had the same split as me in Texas and he rode a 5:15 in KONA so I’m guessing I maybe left 10min on the table vs. riding maybe 5-6watts higher. Goal 4hrs give or take 10min depending on heat and RPE… While moving, Visor on, open bag, glasses on, gel flask down the front of my suit, bag of salt stick and tums in pocket, desoto cool wings in hand, dispose of bag. Relax, smile, and start moving. Saw Scott Dinhofer(taking pics on the bike too), Stephanie Stevens and my Heather twice on the run getting a kiss and hugs from Heather both times. The bike was 100% full sun exposure… The run was just about 100% overcast… I carried my coolwings in hand for 5 miles before hiding them in some bushes. Thought I might regret this decision later but the overcast stayed with me most of the run. Using a steady run/walk EN strategy just below what I thought my could race pace be started ticking off the miles. Sip of gel every 3 miles with water , perform all other miles, ice, sponges, and water for cooling while walking the aid stations. Saw Matt Ancona, Todd Melinger, Dave Tallo , Teri Cashmore all on the run. Really focussed on holding myself back for a while in the beginning and as the run progressed allowed myself to increase RPE but still keeping it just below what I though I was capable of not willing to bury myself for that could split. The result was a pretty steady Marathon with a little fade noticeable in the splits at the Energy Lab and the hills coming back into KONA … Fastest mile was the last ,sub 7min but hey thats down Palani! Dont have a garmin file as it didnt come thru using the multisport function of my 910xt. But here’s the splits from WTC. Pre-swim – 250 cals as 20oz perform and gel…. Bike – 27oz fluid per hr (much higher than normal) 335cal per hr (much higher than normal I skipped 2 planned feeding as I knew I was drinking more calories than normal) consumed as 148oz perform little bit of water, 1 cliff bar, 6 cliff blocks, 1 gel…. Run – estimating 25oz fluid per hr(little higher than normal) , 290cal per hr (little higher than normal) done as 4-5 gels consumed @ one sip from flask with water every 3 miles , perform all the miles inbetween , switching to coke at mile 21. ONE salt stick tab all day at mile 22 since I was now drinking coke…. Skipped mile 25 aid station (the only one). Executing what you should instead of what you could will give you a good day and respectable results…Coming out of the water in 104 out of 175 moving to 80 after the bike and 76 after the run… Steady pacing rules… Racing what you can is always going to be a gamble , you have to risk blowing up and or having a bad day to get those few minutes your looking for.. I’m gonna guess ,if I raced I may have been able to get 10min more on the bike and another 10min on the run… I chose not to race and to save myself for IMFL… Will it work? I’ll let ya know in 3 weeks…I will say this though…. There is absolutely NO WAY to complete 140.6 miles anywhere in any condition and DO NO HARM…. I feel just like I always do after and IM (like I got run over by a bus) … The real test will be recovery from here and Florida performance. They made us leave the helmets on the bike in Transition pre-race….. shoes were optional…. I wish they would standardize these things…. NO AGE markings on calf’s … If there was ever a place the AGE should be on the calf’s I would think it would be here. Was awesome to meet more really cool EN people! Look forward to seeing and racing with you all again. Special thanks to the cheering squad of Stephanie , my Heather for always being there, Scott Dinhofer for taking pic’s , and taking care of me at the finish line and getting me to Heather. They can definitely improve this part of the day finding your loved ones after the race was a bit difficult. Thanks for the great race reports. Tim Cronkite is amazing and I’m so glad to have met him in Texas.